I had flown from Japan a couple hours earlier, leaving behind a world of neatness and composure. Beijing, as I could see once I stepped outside the airport, was on the opposite end. Swearing at the hellish traffic around us, probably swearing at me too, a taxi driver rushed me to my hotel where I met with my parents, still in shock over a similarly moody driver. The next day started rough too as a like-minded taxi driver loudly refused to take us to the nearest subway exit, for reasons only known to him. We got lost for a while before finding solace at a random subway station, where we fought our way to the train amidst staring eyes, for it seemed tourists barely set one foot in public transport in the city. Back on solid ground, our fight wasn’t over as it was time to cross the street. One glance was enough to know that traffic lights weren’t on our side since no car was stopping, whether lights were red or green. Remembering the orderly crossing of Shibuya, my parents were on the verge of apoplexy when we had to follow a back-bent grandmother through fast-moving cars, honking repeatedly. For that reason, the sign at the front gate of the Temple of Heaven banning footballs, skates and rifles, did seem reasonably crazy. Fortunately, we were carrying none and got in. We were all the more surprised to enter a world of serenity that we had almost stopped expecting. The chaos of the city found almost no echo as we walked further into the sanctuary that was the Temple of Heaven Park. On our left, a group of elderly was mastering some tai chi moves, while another group was swinging swords. Not too far from them were two old men waving an oversized paintbrush, soaking it from time to time into rain water used to paint some ideograms on the floor, in a manner of ephemeral calligraphy. The poetry in their gesture came in stark contrast with the fact that they would probably loudly spit on the floor shortly after, as we had seen many elders do, pointing at the utter contradictions of the city in a better way than words could describe. 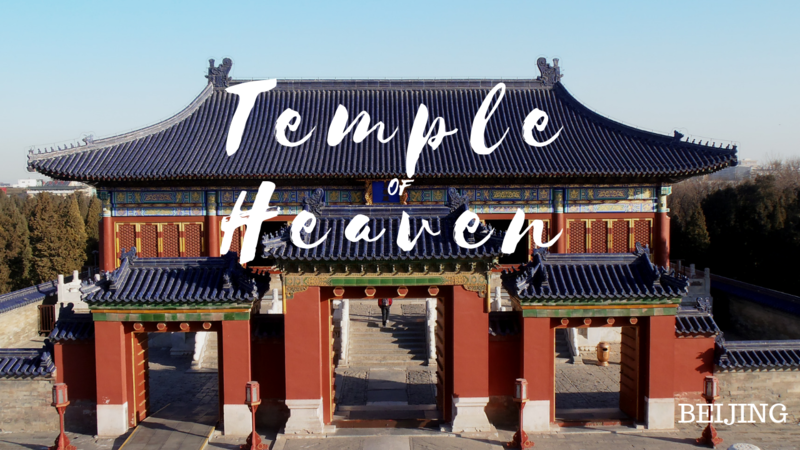 Watching people live their daily routines was so enticing that, when the Temple of Heaven was finally in sight, we had virtually forgotten that it was the whole point of our visit. Majestic and rounded in perfection, it had been screaming for attention all along. We had to admit one thing: it was well worthy of our attention. On that early, peaceful morning, the complex was nearly empty. Tourist coaches had not yet troubled its tranquillity. There was no sign of the proverbial Beijing smog. Heaven above the Temple was clear. The gods of Taoism were in a good mood. At the centre of the complex, the Hall of Prayer for Good Harvests was sitting on its esplanade, commanding awe. Pictured on all paper guides and tourism ads as it was, it looked familiar but still secretive. I walked in circles around it for about as many times as I could, finding more details to please my eyes at every turn. I could even peek at the bright shades of blue, green and red inside the building, which remained inaccessible nonetheless. A jade dragon showed us the way to the other parts of the complex, partly square, partly circular, symbolizing the alliance of Heaven and Earth, represented respectively by a circle and a square. The Temple of Heaven was balanced as all things should be. When it was time to walk through the monumental gates at the end of the park, back into the city, the smell of pollution reached us as soon as the noise of traffic and loud conversations. We got lost again, got helped by a grandmother who did not know one word in English, fought our way through rusty bikes and hasty pedestrians in the middle of a makeshift market, took the subway to the gates of the Foribdden City and then again found perfection. Chaotic yet graceful, rough on the edges yet refined, Beijing was beautifully confusing.